Composer Sarah Kirkland Snider, a graduate of Princeton High School, is co-artistic founder of New Amsterdam Presents, an artist’s service organization dedicated to supporting new music. As a music lover who studied classical music and eventually became a composer, I was fortunate to grow up in Princeton. It’s hard to say exactly when music entered my life. My parents make it sound as though I came into the world humming. My first musical memory is of singing improvised “songs” to my pre-school classmates at Cherry Hill Nursery School during show-and-tell. My parents were nonmusical (though they loved to listen) and we had no instruments in our house at that time, so in my desire to make music, I would knock on the doors of across-the-street neighbors and ask if I could play their piano. Generously, they would oblige — who can say no to a soft-spoken pre-schooler on your doorstep asking to play your piano? I played music by ear on neighbors’ pianos until I turned six, when my father convinced his parents to ship us their piano from North Carolina so I could take lessons. 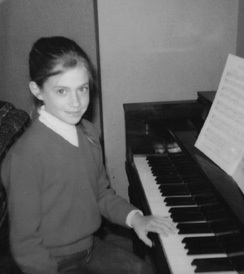 I kept up with piano — I was that weird kid who always wanted to practice — and in fifth grade I added cello to my studies. John Witherspoon Middle School offered lessons in an orchestral or band instrument, and something about the cello just appealed to me. I’m not even sure I knew what kind of sound it made when I chose it, but I chose well. Over the next few years, I had a profoundly good time playing cello in the orchestras of JW, Princeton High School, and Albemarle, the coed summer program of the American Boychoir School, where I also learned to play chamber music. There I performed Mozart’s Eine Kleine Nachtmusik as as part of a string quartet — at age 11, this was pretty much the most astonishing musical experience I’d had. I was fascinated by the different roles each instrument played in the composite texture, and I loved the process of putting the piece together with the other players. Of course, when you’re at the American Boychoir School summer program, you also sing — a lot. I had the tremendously good fortune to sing under Anton Armstrong, the brilliant and inspiring conductor of the world-renowned St. Olaf Choir. Six summers of singing under Mr. Armstrong was an enormously rich experience — more technically informative than any choral singing experience I had in college or grad school (and I sang in some good choirs), and one that I still draw on today when I write for voice. Amazingly, choral excellence awaited me at Princeton High School as well, as Bill Trego and Nancy Parrella had been leading the PHS Choir to become one of the most celebrated high school choral programs in the country. Under them I sang the Mozart, Brahms, and Fauré Requiems; Bach Cantatas; and Handel’s Messiah. All the while, I had continued with piano, studying with the wonderful Janet Westrick (who later founded the Princeton Girlchoir); she introduced me to the great Classical and Romantic piano literature. And in my spare time, I composed — I had always “made up music,” but when I was 9 or 10 I started to write it down. I was shy, however, and for all my musical training, knew little of contemporary music, much less music by women (of any era.) So I didn’t show my music to anyone until my senior year of high school, when my guidance counselor urged me to do so for college applications. My then-piano teacher, the brilliant pianist-composer Laurie Altman, was very supportive — he cannily noted the influence of Joni Mitchell in and amongst the Debussy and Chopin in my writing, and brought sheet music for obscure Beatles songs to our next lesson, pointing out interesting harmonic changes. I encountered a remarkable number of exceptional music teachers while growing up in Princeton — an embarrassment of riches, really. I learned a great deal from all of them, and each one influenced the way I think about music. But in terms of my decision to screw my courage to the sticking place and pursue composition as a career, the local musicians whose example may have inspired me most were Gail Edwards and Portia Sonnenfeld. Snider at the piano, age 10. Mrs. Edwards conducted the PHS Orchestra when I performed in it. As a musical educator, she had a firm handshake but light touch: she demanded excellence, but with a style that was elegant and understated, even playful. She smiled a lot and her love of making music was palpable in every rehearsal. She was dignified and commanding, graceful and humble all at once, and you could hear it in the music she made. Playing one of the Brandenburg Concertos under her was a formative highlight of my musical life. Ms. Sonnenfeld was a revered musical presence and something of a living legend in Princeton, having founded both the Princeton Symphony Orchestra (then known as the Little Orchestra of New Jersey) and the Youth Orchestra of Central Jersey, and having led the Princeton High School Orchestra on many successful international tours. A lot is made of the importance of role models, particularly for girls and young women in highly male-dominated fields, and rightly so. Role models inspire and embolden; they give us the audacity to dream. When I was young and writing music, I’d never heard of a female composer, not even Clara Schumann or Fanny Mendelssohn. In all of my composition studies — undergraduate and graduate, festivals and masterclasses — I never had the opportunity to study with a woman; there were none on the faculty. But I did have the experience of playing in an orchestra under Gail Edwards, and growing up with the example of Portia Sonnenfeld. There I saw women at the helm of orchestras, commanding that most unwieldy musical behemoth with grace and aplomb. Their place on the podium seemed so natural, so perfectly in line with the way things should be, that I blissfully had no idea female conductors were a rarity. Their example inspired me then, it inspired me throughout my composition studies (when I was sometimes the only female in the program), and it inspires me today. It has been very moving to have my musical history in Princeton brought full circle by my collaboration with the Princeton Symphony Orchestra. On May 15, 2016, the PSO will give the Northeast premiere of Hiraeth, a large, multimedia work they co-commissioned from me with the North Carolina Symphony. ‘Hiraeth,’ a Welsh word with no direct English equivalent, is loosely translated as homesickness tinged with grief or sadness over the lost or departed; a longing, nostalgia, or wistfulness for a time and place we cannot return to. I wrote the piece on notions of home, family, and childhood, and the passing of my father, who died shortly after I began composing it. It will be an honor to make music with members of this community again. While some of my beloved and admired musical heroes from Princeton will not be here to share it with me, it is thrilling to see the institutions they founded and the musical values they instilled in this community continue to bear fruit decades later. It feels like a homecoming.